Metatarsal Pain is pain located at the forefoot (front part of the foot before the toes). The foot has 5 metatarsal bones that extend forward to the toes, as well as a metatarsal arch, which can sometimes lose its position and alignment. A metatarsal pad may be recommended in conjuction with a custom orthotic insert in order to help alleviate metatarsal pain. Other pain relief suggestions include massage, chiropractic foot adjustments, ice, rest and soft tissue work using a tennis ball. Metatarsalgia - Metatarsalgia (literally "metatarsal pain," colloquially known as "stone bruise") is a general term used to refer to any painful foot condition affecting the metatarsal region of the foot. This is a common problem that can affect the joints and bones of the metatarsals. 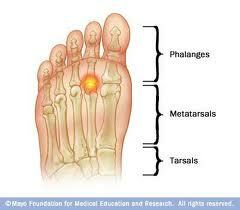 Metatarsalgia is most often localized to the the first metatarsal head (the ball of the foot just behind the big toe). The next most frequent site of metatarsal head pain is under the second metatarsal. This can be due to either too short a first metatarsal bone or to hypermobility of the first ray (metatarsal bone + medial cuneiform bone behind it), both of which result in excess pressure being transmitted into the second metatarsal head. What is the most effective metatarsalgia treatment? What metatarsalgia exercises & stretches do you recommend? What symptoms are most commonly associated with metatarsalgia? What exactly is a metatarsal & what shoes are best for metatarsalgia? Why is my metatarsalgia pain so acute?